Mobile Industrial Robots, MiR is a leading manufacturer of collaborative mobile robots. They are dedicated to developing user-friendly, flexible and safe robots to help companies increase the efficiency of their operations. These autonomous robots are a new generation of advanced mobile robots which give you a rapid return on investment, often with a payback period of less than a year. The highly flexible MiR100 autonomously transports up to 100 kg (220 lbs). It can be mounted with customized top modules such as bins, racks, lifts, conveyors or even a collaborative robot arm—whatever your application demands. Top modules are easy to change so the robot can be redeployed for different tasks. 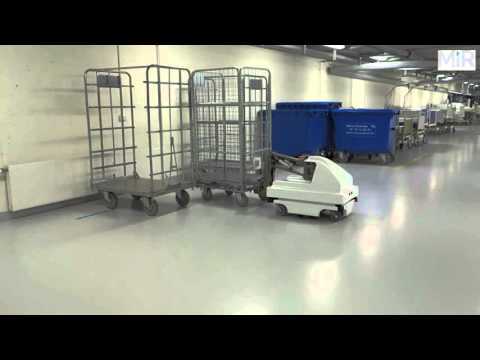 Safe maneuvering and easy programming The MiR100 robot safely maneuvers around people and obstacles, through doorways and in and out of elevators. You can download CAD files of the building directly to the robot, or program it with the simple, web-based interface that requires no prior programming experience. The robot’s mission can be easily adapted using a smartphone, tablet or computer connected to the network. MiRHook™ is ideal for a wide range of towing jobs, such as efficiently moving heavy products between locations in a manufacturing facility or warehouse, or moving linen and food carts in hospitals. The MiRHook supports the transport of loads up to 300 kg (661 lbs), providing exciting new internal logistics options for weighty or unwieldy cargos. With built-in sensors and cameras and sophisticated software, the MiR200 can identify its surroundings and take the most efficient route to its destination, safely avoiding obstacles and people. MiRHook™ 200 is ideal for a wide range of towing jobs, such as efficiently moving heavy products between locations in a manufacturing facility or warehouse, or moving linen and food carts in hospitals. The MiRHook™ 200 supports the transport of loads up to 500 kg (1100 lbs), providing exciting new internal logistics options for weighty or unwieldy cargos. our MiR robot will never run out of power in the middle of a job. MiRCharge™ is a fully automatic charging station that offers flexible deployment options to meet your needs. The robot autonomously returns to the charging station and connects when its battery falls under established limits. It can also be programmed to regularly recharge between deliveries, such as when it returns to a stockroom or depot, which can allow the robot to run nearly continuously. MiRCharge™ fully charges a MiR robot in about two hours. The MiR500 is an extremely robust robot designed perfectly industrial environments. for both heavy and light transport that can optimize logistics throughout the entire production chain, from the warehouse to the delivery of goods. With a lifting capacity of 500 kg (1102 lbs) it can automatically collect, transport and deliver pallets with speeds of nearly 7.2 kilometers per hour (4.5 miles per hour). The high speed of the MiR500 streamlines pallet transport in all types of companies and frees up employees so they can carry out more valuable activities. The new MiR1000™ is the most robust robot that Mobile Industrial Robots offers to date, with a payload of 1000 kg (2,200 lbs). You are able to optimize your pallet transportation: MiR1000 picks up, transports and delivers pallets autonomously with the MiR1000 pallet lifts, and ensures a smooth, safe, and efficient transportation of your pallets. MiR1000 automatically navigates around obstacle, and is able to re-route to avoid stopping or delaying the delivery of materials. MiR1000 does not need to be manned, so it optimizes the transportation of pallets and frees up employees for more valuable tasks. MiR1000 is controlled via smartphone, tablet or computer using the intuitive MiR Robot Interface, and it can be programmed without prior programming experience.